Several generations of musicians did not regard themselves as having “made it” until they recorded an album with a string orchestra. In the 1940s, ‘50s and ‘60s, this symbolized not only the idea that popular musicians and vocalists could integrate their styles with orchestral/classical themes, but also the “legitimacy” of one’s music and the record company’s faith in an artist. Likely the first major jazz musician to have this idea was alto saxophone legend Charlie Parker. Until then (1949) string orchestras had been used almost exclusively for classical music. The closest jazz came to symphonic music had been in the works of George Gershwin, whose compositional style had one foot in the classical world and one in jazz. Parker, who along with trumpeter Dizzy Gillespie is credited with creating modern jazz, had both a fondness for strings, as well as an and ambition to perform with a classical orchestra. This was initially manifested in Parker casually dropping musical quotes from such classical composers as Igor Stravinsky into his solos in otherwise regular bebop performances. Parker had no experience with orchestral composing and arranging, though in the early 1950s, he is known to have talked about studying classical composition. Had he not died in 1955, Parker may have branched into those forms as others did in both the later 1950s and 1960s. The Jazz Scene was not released until 1949 and it’s possible that the reception to this ambitious survey of contemporary music may have cemented the idea of a strings album in the minds of both Parker and producer Norman Granz. Once Granz was able to sign Parker to a recording contract for his Clef label (later to be re-named Verve), Parker soon recorded his first sessions with a string orchestra. There would be three such orchestral dates for Clef, plus a live Jazz at the Philharmonic set with strings recorded at Carnegie Hall. The resulting records were extremely popular — amounting to Parker’s only real hits. Over the years, these sessions would be released and re-released as 78rpm singles and albums, 33-1/3rpm LPs and CDs in various configurations as Parker’s legend grew after his early death. Now, these extremely influential sessions have been collected together in a two CD set chronicling all of Parker’s “strings” recordings. The most outstanding example is “April in Paris,” which actually charted as a top forty hit when it was released. 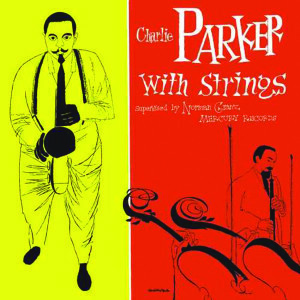 As with most “jazz with strings” recordings, the softer, smoother strings backgrounds are played in something of a counterpoint to Parker’s energetic alto lead. The same is true of George Gershwin’s “Summertime,” which had recently been a hit for New Orleans soprano saxophonist Sidney Bechet. With its orchestral roots as part of George Gershwin’s jazz opera “Porgy & Bess,” Parker and the orchestra are able to completely integrate their respective styles. Parker’s string recordings started a trend of jazz musicians recording with strings — sometimes successfully, sometimes not. The ensuing controversy among jazz fans over these LPs (pro and con) did little to stop the flow of orchestral jazz LPs over the years. Everyone from Clifford Brown to Ornette Coleman would record with string orchestras at one time or another. Jazz musicians continue to record with strings to this day, though today they are more likely to be backed with a string quartet or small ensemble rather than a symphony orchestra. Parker too may have ultimately recorded with smaller string groups, but the sessions he did leave us with remain some of the best of the form.